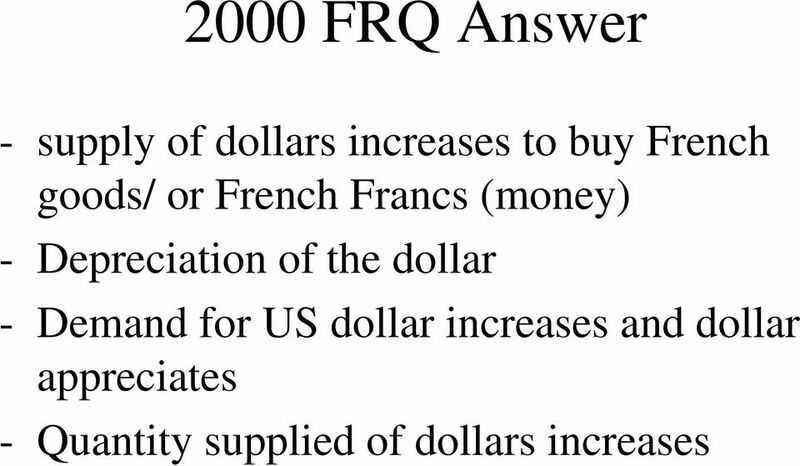 Download "Practice Foreign Exchange FRQ Questions. 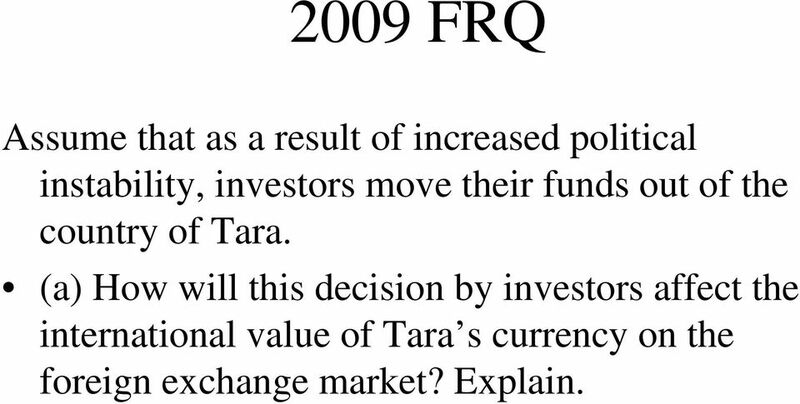 The answer with explanation is on the slide after the question"
2 2009 FRQ Assume that as a result of increased political instability, investors move their funds out of the country of Tara. (a) How will this decision by investors affect the international value of Tara s currency on the foreign exchange market? Explain. 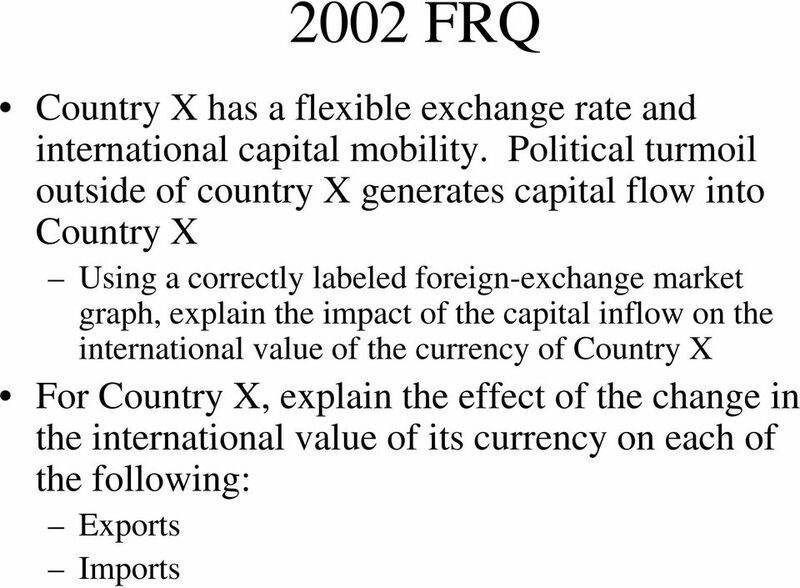 3 Answer to 2009 FRQ (a) 2 points: One point is earned for stating that Tara s currency will depreciate. One point is earned for explaining that capital flight increases the supply of and/or decreases the demand for Tara s currency in the foreign exchange market, thereby lowering the market equilibrium exchange rate. 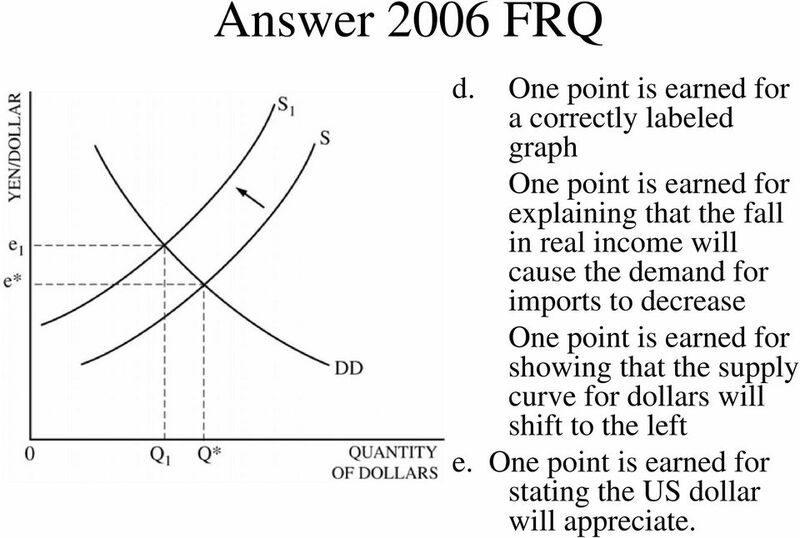 5 Answer 2006 FRQ d. One point is earned for a correctly labeled graph One point is earned for explaining that the fall in real income will cause the demand for imports to decrease One point is earned for showing that the supply curve for dollars will shift to the left e. One point is earned for stating the US dollar will appreciate. 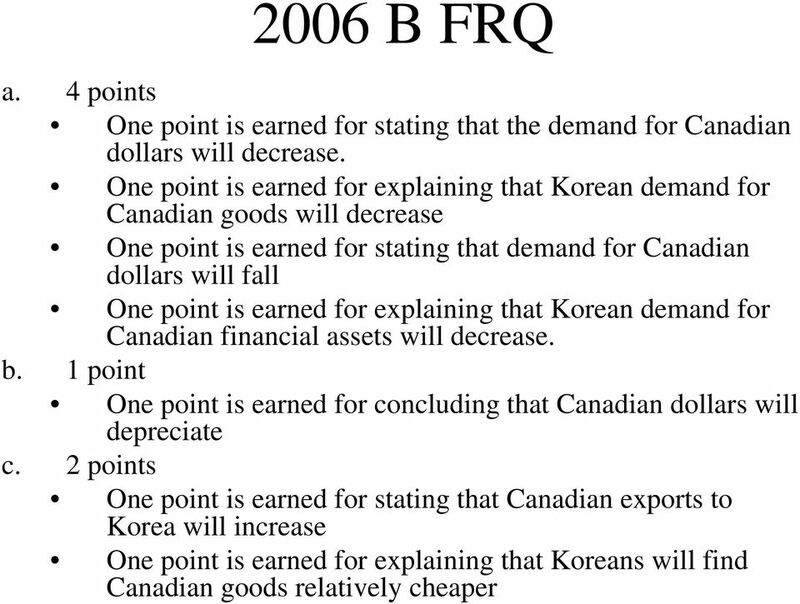 6 2006 B FRQ Assume that South Korea and Canada are trading partners. The equilibrium exchange rate between the Canadian dollar and the SK currency, the won, is shown on the graph of the foreign exchange market. a. 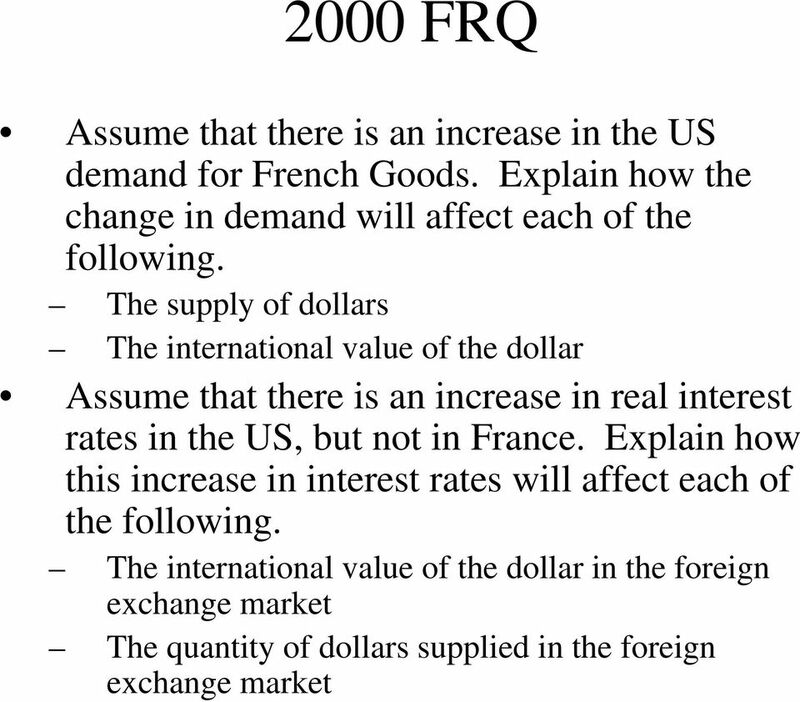 Explain how each of the following will affect the demand for the Canadian dollar i. The inflation rate in Canada is higher than the inflation rate in SK ii. Real interest rates in Canada fall relative to real interest rates in SK b. Given your answer to part (a)(ii), indicate how the value of the Canadian dollar is affected. c. As a result of the currency change in part (b), what will happen to Canadian exports to SK? Explain. 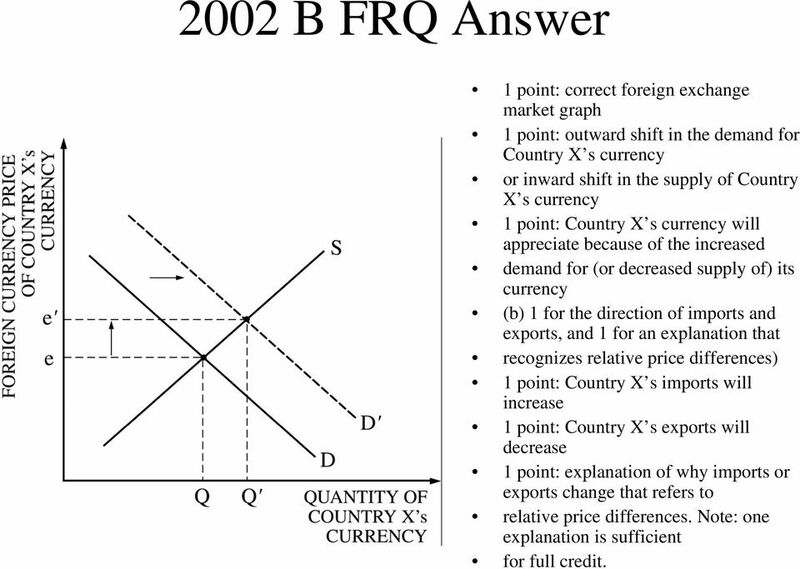 11 2002 B FRQ Answer 1 point: correct foreign exchange market graph 1 point: outward shift in the demand for Country X s currency or inward shift in the supply of Country X s currency 1 point: Country X s currency will appreciate because of the increased demand for (or decreased supply of) its currency (b) 1 for the direction of imports and exports, and 1 for an explanation that recognizes relative price differences) 1 point: Country X s imports will increase 1 point: Country X s exports will decrease 1 point: explanation of why imports or exports change that refers to relative price differences. Note: one explanation is sufficient for full credit.